Day 5 Aboard the Disney Magic - A Day at Castaway Cay! Everyone in my cabin slept like a baby last night after our Marvel Day at Sea. Good news! The Avengers decided to stay another day or two and relax so they’re available for autographs, hugs and photos! When we opened up the sliding door to our verandah, we spotted land in the distance. 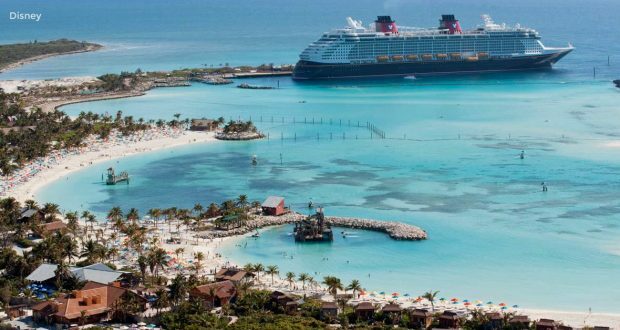 Castaway Cay is ready and waiting for us to enjoy a beautiful day in the sun and surf! Here’s what we did on Disney’s gorgeous private island! The sandy shores of this Bahamian island are just a gangplank away! So we grabbed our Keys to the World cards, donned swimsuits, flip flops and sunscreen and headed ashore! 2. What to do, Where to go? Swimming, stingray encounters, snorkeling, shopping, eating BBQ, drinking fruity drinks, lounging on a beach chair or swinging in a hammock – these are just a few of the activities available to cruisers. I found a hammock under a quartet of green palm trees where I’m lounging writing this article. Kids can swim out to the water slide complex in the water. If your kids have enjoyed Oceaneer’s Club they can choose to partake of the supervised kids areas on the island where Disney staff will entertain and feed your little guy or gal while you take a snooze in a lounge chair! There’s also “In-Da-Shade” for tweens to enjoy ping-pong, basketball, pool tables, drinks and snacks and other supervised activities. They can come and go like the do in “Edge” on the ship. 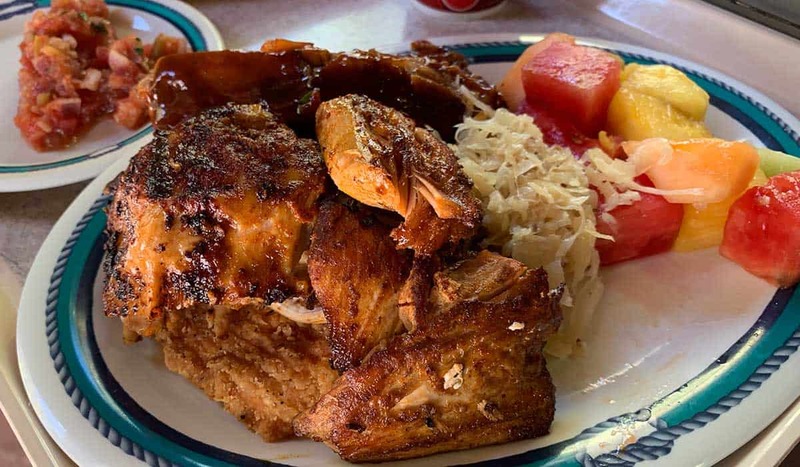 Cookies BBQ buffet is available in two spots on the island and offers a dizzying array or dining favorites. Snow cones, sweet treats and boozy drinks are available in a variety of places along the stretch of beach. We head out to sea again soon so it’s time to say goodbye to our island paradise. Instead of taking the tram, we opt to meander along the walkway the entire length of Castaway Cay to soak in the experience. This also give us an opportunity to buy a few souvenirs that you can only find here on the island. Our Key to the World card gains us entrance back on the ship. After we grab a shower and dress for dinner we head back out for a visit with Stitch, Daisy Duck and Chip and Dale. There’s also $10,000 Final Mega Jackpot Bingo. We even have time to check out a few minutes of Thor: Ragnarock in the Buena Vista Movie Theater before dinner! Imagine eating in a space where the whole space comes alive with color and music. When we arrived, the walls were white with black sketches of Disney animations. Even the wait staff wore a monochromatic outfit. Then we ordered our dinner from an array of choices. I highly recommend the Black Truffle Pursiettes and Slow Roasted Breast of Chicken. Shortly after dinner was served then the real show began and the restaurant came alive with color! We even had a visit from the mouse himself! Mickey danced around the restaurant to shouts and cheers of diners. A splendid experience! Disney Dreams: An Enchanted Classic features a little girl who discovers the magical power of her dreams. We flew through the air with Peter Pan and were delighted by visits from other beloved Disney characters as well. I believe this was my favorite show from all our evenings on the boat. A must-see! It’s a perfect way to end a relaxing and magical voyage! Our voyage aboard the Disney Dream is an experience I’ll never forget. And I fully intend to add to my memories with more Disney cruises in the future. I asked our cruise director what differentiates a Disney cruise from other cruise lines. 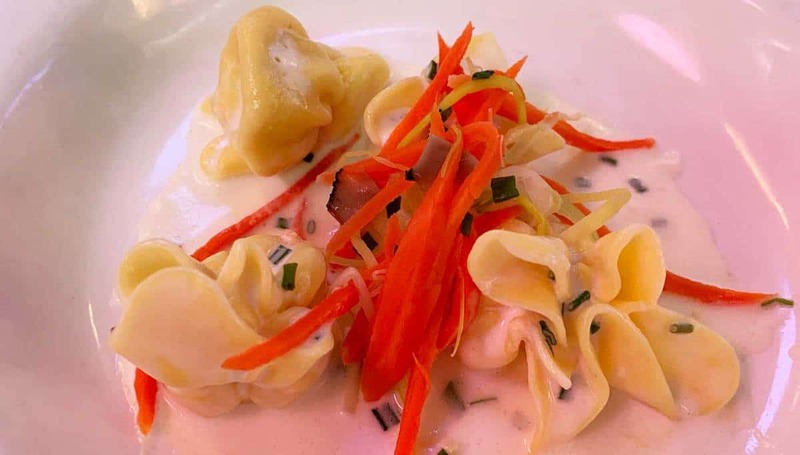 The phenomenal Disney service, storybook magic and theming of the ships and fantastic food amongst other things makes a Disney cruise a slam dunk for the whole family. We’ve come to expect more from a Disney vacation whether that’s in a Disney park or cruise because of their incredible creativity and attention to detail. I came aboard the Disney Magic with high expectations and DIsney did not disappoint, in face they exceeded my expectations in grand Disney form! Book your Disney cruise now and you’ll see what I mean! Interested in Cruising with Disney? Read about our other days aboard the Disney Magic.